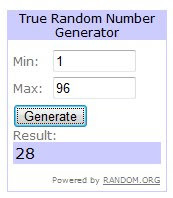 The winner of the $70 CSN Stores giveaway is Shannon from Shannanigans. Congrats Shannon! Shannon just became a new Mom last week so I'm sure she won't have trouble putting the $70 to good use! Thanks so much to all who entered. I hope to have another giveaway soon. My favourite colour is green, I love crafts and food and flowers. Finding your blog has made my day!